My tree was finally up and decorated a week before Christmas. I’d been so busy in my shop, Crystal Clear, that by the time I dragged myself upstairs at the end of the day, I was too tired to do more than feed Raffles and eat whatever didn’t require much preparation, sometimes just an apple and a chunk of cheese. I couldn’t complain though. We’d had such a mild Autumn in Sedona that the tourists had come in record-breaking numbers. I'd had trouble just keeping the shelves stocked. I realized that the only way I was going to get the tree done in time was to ask Daniel and Sierra to help, so I bribed them with the promise of a pizza dinner. Even Raffles helped out, although she got sulky if anyone moved an ornament she’d hung. Two days later I noticed one of my ornaments was missing. In its place was a picture of an ornament that looked like it had been cut from a child’s coloring book. It had been carefully filled in with red and green crayons, not a mark straying outside the black outline.Since I was accustomed to my not-a-cat’s habit of bartering one item for another, I didn’t think much about it. But the next morning I awoke to find two more ornaments missing, replaced with drawings of a gingerbread house and a snowman. If Raffles continued taking the ornaments at her present rate, there wouldn’t be any real ones left by Christmas. Not to mention that there was probably a child out there who was upset about her missing pictures. For those reasons, as well as to satisfy my curiosity, I decided to follow Raffles on her nightly rounds. I went to bed in my clothes, and when Raffles scooted out the window I leave open for her, I ran outside hot on her trail. On four legs she’s a lot faster than I am, so it wasn’t long before I lost sight of her. I was on the verge of giving up when she doubled back to me. After that she slowed her pace and kept checking over her shoulder to see if I was still there. Apparently she wanted me to come along. Twenty minutes later she stopped in front of a small house. Even in the dim cast of a street lamp, it was obvious that the house was in need of repair. Plywood had been nailed over a broken window, and sheetrock showed through the adobe walls in half a dozen places. A single fir tree grew in front of the house. And there were my missing ornaments, hanging among the remaining paper ones. As I watched, Raffles reached into her pouch and withdrew two more ornaments. She set them carefully on the ground, then came to me, took my hand in her little, furred one, and led me back to the tree. She picked up one of the ornaments and pointed to a spot higher on the tree than she could reach without climbing it and potentially knocking off the other ornaments. Once I’d placed it there, she trilled her approval and showed me where she wanted the second one placed. Then she plucked two of the drawings from the tree and tucked them into her pouch. When she turned back to me, she was smiling - well, smiling the best she could with her sweet, cat-like features. On Christmas day, Sierra, Daniel and I went back to the small house. By then all of my ornaments adorned the tree. We rang the doorbell and introduced ourselves to Nancy, the single mom who lived there with her six year old daughter, Bethany, and we spent the day making repairs to the house, inside and out. Nancy insisted we stay to share their dinner, so I went home to get Raffles. Although we’d been keeping the not-a-cat a secret in order to protect her, we decided it was time to make an exception. When we introduced her to Bethany, the two bonded instantly. Later, as we were saying goodnight, Bethany proclaimed it the best Christmas ever. And we all agreed that it was. What was your pet's role in a past holiday celebration? Killer Characters is giving away a book a day throughout the month of December. Today it's my turn. To enter, simply leave a comment and your email address so I can let you know if you're the winner! Winners' names will also be posted on the left side of the Killer Characters page. Does recognizing which presents are yours and going under the tree to get and open them count as playing a role in a holiday celebration? We didn't even realize there was a dog toy wrapped among the presents from out of state, but the dog sure did! My 15-year-old kitty-boy works hard as our Home Security Patrol Officer, so he pretty much oversees everything that goes on in the house, including holiday celebrations! My dogs like to sniff the ornaments on the tree - hoping they find one they can eat. Unfortunately for them, the candy canes are hung much higher than their noses can reach. Yesterday my labradoodle sat beneath the tree and barked at the candy canes that were out of her reach. Both of my dogs gets dressed up for the Christmas card photo and they enjoy opening their own presents Christmas morning. Over the years we've had many four legged members of our family. Mostly the dogs try to see if they can re-arrange the ornaments. One pup liked to hide them. And one decided the tree and all of the presents were his and marked them accordingly. That was an interesting Christmas morning. My dogs roll was to clean up all of the cookie crumbs the kids dropped. My cocker spaniel, Dusty, always gets his gifts when I get home from the Christmas Eve service. I don't put up a tree because I spend most of the Christmas season at my father's house. Our cat tried to EAT the artificial tree. She quickly learned to chew on a new cat toy instead! I don't have any pets. We travel way too much! But we used to have a cat that liked the tree. And to eat tinsel, so we had to quit using it. Otherwise, he was good with the tree. My dogs like to help my kids open their presents, and my cats are constantly messing with the tree. My parents were not holiday people. The most I ever remember them doing is sticking an electric Chanukah Menorah in the window with all the light lit at the same time. Our dog "Cuddle" played very little role in all of this. That's quite a story! Very heartwarming! This will be my cat Puck's second Christmas. Last year, still a pretty small kitten, he climes the Christmas tree. 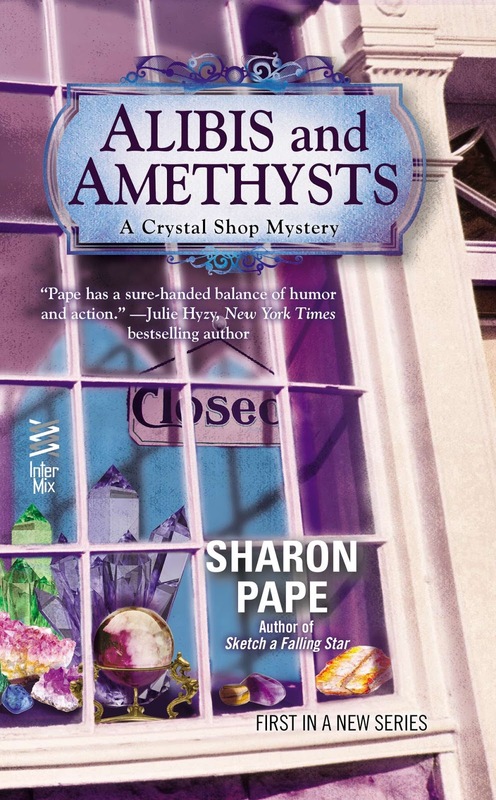 I'd love to read more about Raffles and the mystery in the crystal shop. Our house is full of animals with 2 cats and 2 dogs---they get more presents than we do. I'd love to read this book. Thanks for the contest. Have been wanting to read this one. Marvelous story. It gave me goose bumps. Dressed up a goat with antlers and took around to visit family & friends on Christmas Eve. Family loved and other drivers honked & laughed. Hope to see some more entrants for such a good book. My Bella cat, came to us right at Halloween! She is a beautiful, long-haired, black fur ball stray, who quickly became family! She celebrated her first and every Christmas since with us, by playing with the tree ornament balls and chewing on the icicles when we aren't looking! Love your book and thank you!! Our dog tries to get in the middle of the holiday festivities. Thanks for the chance to win. I finally had a tree with all unique ornaments including several crocheted by my aunt who could no longer do handwork. It was the most beautiful tree I had ever seen. Our cat, PT (Pinball Too after the one who looked just like him but had rocketed around the cab of the pickup when my husband brought him home). PT had never paid any attention to the ornaments above the bottom row where is special pet friendly ones hung. Never that is until THAT Christmas. We had the family celebration at our house which might have gotten him stirred up but we will never know., By the 3rd day after Christmas, we noticed parts of the tree becoming very bare. About that time, he started this "game" in front of us. He would capture an ornament, play with it until the dogs noticed and joined the game so he attacked a new one. After all, who wants to share with a dog!.Unfortunately by that time they had destroyed several of my favorites. The tail of the labrador retriever was great for removing decorations and sending them flying which apparently added to the game. Tracking PT through the house, we found his stash of destroyed ornaments in the bottom of the linen closet. He was so proud of his collection. That is the last year we put anything special on the tree yet we had many a laugh at the memory of the three dogs and a cat happily playing their made up game. Some of the more special ornaments that were left found new homes on the mantle and a wreath. He never messed the with three again. The new stuff just wasn't good enough for him. When we had a live tree - many years ago - the cat's would just sit and watch until we filled the tree stand with water. It became their water bowl, and they'd let us know when it needed refilling. Ball ornaments had a way of disappearing, usually into the kitchen where we could hear them being batted across the floor. Sadly, this is our first year without a four-legged friend. Our beloved Roxie used to enjoy getting all tangled up in the lights and tinsel, then posing for her holiday photo op! My recent dog just sniffs the ornaments although one year I received an ornament made with tree branches . Buddy could not stay away from the tree and ate most the ornament. Sadly Buddy my furfriend just passed away September 25. When I was younger my dog Mikey thought all presents were for him. After opening his present we would allow him to open some of the other gifts. Love Christmas books. Our puppy tore the balls from the Christmas Tree...is that helping? lol.. I love you Guest Post. I'm lucky, so far our pets haven't touched the tree. Alibis and Amethysts sounds good. Hope it'll be in paperback someday for those of us who can't do e-books. Our Wlsh Corgi, Shelby use to love to curl up by the fireplace and watch us decorate the tree. Unfortunately she was not with us this past weekend to watch us. Shelby crossed over the Rainbow Bridge three weeks ago. Still miss her very much. My dog likes to sniff all the presents under the tree. Our dog barks at the totes that contain all of the decorations when we bring them down from the attic. He is also the official gift inspector once they are placed under the tree. Finally, he must be in the middle of the action when the wrapping paper is torn off the packages. He gets so excited. Most of my Christmas ornaments are out reach of my cats. I have cats that like to climb my tree and play with my ornaments. My dog Paisley will be a year old this Christmas. She loves stuffed animals and thinks every one is hers. I have stuffed snowmen and reindeer that go under my tree. I've already had to rescue them from her several times. Our two kitties could care less about Christmas trees. All they are interested in the sound of a can of cat food being opened. I guess they are too well fed to care about anything else. We have cats and they get their own presents. Funny but they all their own personalities. Our dog is so very sweet, he's 12 years old and goes to see Santa every year. He gets as excited as any child does, and knows his name so you have to be careful not to say it unless you want him hyper for a few days. He also opens up his own presents, he has a lot of fun with that but recently is more happy to just sit there and let you open it for him to reveal his new toys or treats. A few years ago my cat sat on bottom branch of my brand new Christmas tree, and now that branch sags. She was a healthy weight, but I decided that maybe we needed to lay off on the treats! It sounds like a really cool book. I know some people who are interested in crystal. I have also been inside a crystal selling store. Thanks for the giveaway and the chance to win! Aww what a cool story. We used to have a dog who would unwrap her own presents. I think the most amazing animal story that I know of happened to friends of my parents with elderly poodles. They were deemed too old to eat anything crunchy and yet they were able to tear into a sealed TIN container of Amaretti di Saronno cookies one year. The tin container was absolutely shredded. The dogs had to be taken to the vet to see if they had ingested any of the metal or cookies and they were all right but we were all slack jawed with amazement over their pure determination. Love your series! Thank you for this wonderful opportunity! Have read a book of yours and liked it. Looking forward to reading all books you write.